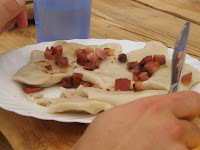 After writing about making crepes and recalling them from my trip to Poland last summer, I began to think about Pierogi, which are really the Pole’s form of ravioli but made in a different shape. These photos of pierogi are entrees from two different restaurants–one in a small village near the Lithuanian border and the other in Krakow. There are various fillings but the most common are cheese, potato, or sweet cabbage. I must admit that I’ve never made pierogi from scratch; I usually buy them frozen at one of two Polish specialty stores (1, 2) in the Dorchester section of Boston. But I decided to dig out my Polish cookbook to see how difficult they are to make. Polish Cookery is an English adaptation of what has been referred to as the bible of Polish cooking (UNIWERSALNA KSIAZKA KUCHARSKA (The Universal Cook Book) by Mme. Marja Ochorowic-Monatowa published originally in1911: “Its original purpose, stated rather primly by the author, ‘is to give brides a knowledge of how cooking is done, so that they may supervise the servants properly’” (iii). Well, I don’t have any servants, but I could supervise my husband (he’s Polish) in making Pierogi. As I mentioned previously, the recipe (page 253 Polish Cookery) for the dough pockets is similar to ravioli, except the pierogi dough uses fewer eggs (4 instead of 2): 2 cups flour, 2 small (or 1 large) eggs, and few spoonfuls of lukewarm water. Mix together until firm and cut into 2 pieces. Keep dough covered in a towel while preparing each piece. If you have a pasta machine roll each piece until it looks like a thin sheet and cut into 13 inch pieces (x 5” or so) (otherwise use a rolling pin). Arrange stuffing by the spoonful along one edge every 2” then fold over the top of the filling dough from the other end. Cut out around the filled sections in the shapes of a half circle using a pastry cutter, then press edges of dough together on the seam side. Any remaining dough can be reshaped and rolled out to repeat the process again. Cook in hot boiled water. When they float to the surface, take out with slotted spoon and serve with butter. 2 egg yolks, 1 Tablespoon butter, 1 pound of pot cheese, farmer cheese, or cottage cheese mashed, dash of salt, 1 Tablespoon sugar, and ¼ raisins (optional). Mix yolks and butter first, then add other ingredients. Sugar and raisins are added for sweet-tasting cheese filling. Another easy filling is quite simply 3-4 pitted cherries (or equivalent amount of berries). After pierogi are boiled serve sprinkled with sugar and sour cream. Sounds yummy! Oh man, true cheese Pierogi are one of my favorite things in the world!